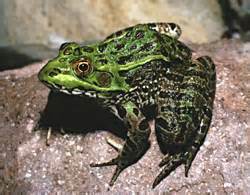 One of the first endangered species projects the Group got involved with was to help the Magoffin family develop reliable water for a Chiricahua leopard frog population. Beginning in 1994 a stock tank that had supported the frogs for many years began to go dry. The Magoffins started hauling water, 1,000 gallons per week, for what turned out to be over two years. The Magoffins asked the Group to help improve the water system at the tank so frogs could be sustained without the herculean water-hauling task. We approached the Arizona Game and Fish Department and received financial support to drill a new well and build a water system that fed a pond for the frogs and a drinker for the cows. That was our first experience with taking on a project that helped an endangered species, and also provided some real benefit to the ranch operation. Through the interest of a biology teacher at Douglas High School, a Chiricahua frog propagation project was started at Douglas Schools that won national awards and stimulated under-achieving students to get involved with science. The school frog project suffered a setback when the original teacher moved away and concerns were raised about mosquito-born disease. However, the program is getting started again, and we hope that it will be an important source of frogs to help recover the species in our area.